Mueller State Park is located northwest of Pike's Peak and is probably one of the nicest parks that I have visited. 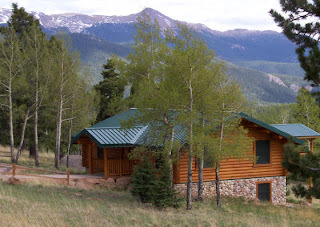 It is heavilly wooded with a mix of Aspen and Ponderosa Pines and has incredible mountain views throughout the park. In addition to the many camping opportunities, there are several very nice log cabin rentals to choose from. Here is a picture of one of them.